We are so used to the Academy disappointing us year after year that when it doesn't, we're at a loss for words. Okay, so 2007 wasn't bad, a gleeful, long-delayed celebration of Martin Scorsese and his The Departed. But we had shut-outs then too, films like Pan's Labyrinth and Children of Men, easily the year's best movies, kept away from the top categories. This year, the Oscars have outdone themselves. It's been a mammoth year for cinema, and Joel and Ethan Coen -- the most inventive directing duo ever -- deserve all the plaudits they can get for their No Country For Old Men, and so what if it isn't really the best film? On any other year it would be, but Paul Thomas Anderson's There Will Be Blood dwarfs it, a mammoth character sketch that -- while as bleak and nihilistic as No Country -- chooses the manly route of moral exploration rather than the all-too convenient ambigious finish, that fashionable 'open-ending.' Or at least that's what I think. However, they are the Coens and we all need to worship Joel and Ethan, the men behind Blood Simple, O Brother Where Art Thou, Barton Fink, Fargo and The Big Lebowski. They've been working for 20 years, and Uncle Oscar, as Marty is well aware, often recognises quirky greatness only after its been canonised, after it can no longer be ignored -- and, usually, in a year when Clint Eastwood hasn't made a movie. Phew. Which is why, Paul Thomas Anderson fans, it is important to remember that Joel is 53, Ethan is 50, while good old PT Anderson -- despite Boogie Nights, Magnolia and Punch Drunk Love all being supreme examples of the craft -- is just 37. His time will come, but possibly not for another dozen years. The Academy can't seem to deal with precocious geniuses -- just ask Quentin Tarantino. Another man worth asking would be Johnny Depp, nominated for Best Actor thrice since 2004, and losing out each time despite being the most popular marquee name internationally, as well as a critical favourite. Depp's Jack Sparrow was a staggeringly original character, and while he'll continue to do bizarrely great work, I predict he'll continue to be marginalised till they finally give him the award for a relatively lackluster Pirates VII or something. It is worth noting that his best performances -- Ed Wood, Edward Scissorhands -- were never even nominated. The only category this year without debate was Best Actor, Daniel Day-Lewis delivering a bravura performance that ranks right up there with the best of Laurence Olivier, Peter O'Toole or Dustin Hoffman. It's a tremendous act, and something we should all be proud to have seen afresh, to have been around to feel it full-blast, as it hits legendary status, not years after. It's a Classic. As said, It has been an immense year, where Oscar hasn't dipped into mainstream RonHowardy fare, but indulged us with esoteric masterpieces. With Juno, The Savages, and Michael Clayton among the nominees, they created a nomination list that almost killed dissent -- so balanced were most nominees, so stunning their work, that we'd likely applaud any winner. Not that the Kodak Theatre wouldn't have been burnt to the ground if they handed Best Film to the inexplicable Atonement. 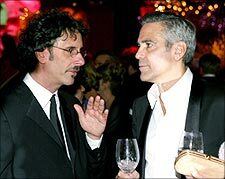 Sure there were issues with the nominees, but all in all the Oscars did good, rewarding Tilda Swinton for Michael Clayton and composer Dario Marianelli for Atonement. Really, credit where it's due. And in the end, while we may sit down and passionately argue about No Country and Blood, about Julie Christie and George Clooney, it's been such a marvellous year at the movies that the Oscars have just brought out a watching list of great cinema, and results worthy of debate, not disgust. We're all winners. Hang in there, Paul. There will be gold.